“Pretty bad night – barely had a chance to sleep. Firstly because the conditions have been mega gusty with squalls and the risk of doing spinnaker damage, and secondly unfortunately because my main autopilot system went down. 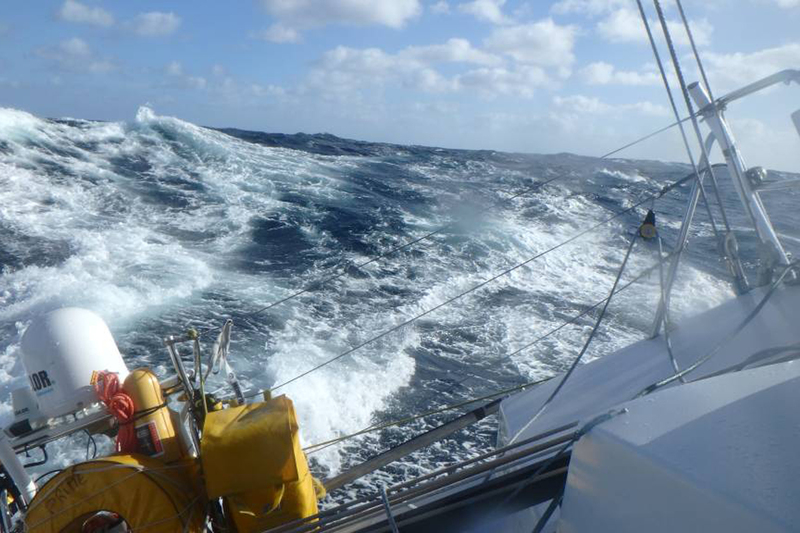 “I was below at the time, trying to get a short power-nap when the pilot locked up hard to port when sailing at around 15 knots – it threw the boat into a crash gybe. This is a nightmare situation when you have the spinnaker up as it lays the boat right on its side, stopped in the water, with all the sails pinned against the rigging. I had no choice but to engage the spare pilot while the boat was stopped, and then sort out the mess. “The spare pilot is not as effective at course-keeping as the main pilot on board and so it’s more difficult to push the boat on its edge. It is immensely frustrating as the pilot problems I had before the race where evidently not solved, and it means that the downwind sailing will be more tense and I will get even less sleep. We have been following you from the start of the race. We are all amazed at what you are doing. Keep going, you have lots of people in Jersey supporting you. Well done.